 Suites & Villas Accommodations — Sapphire Beach Resort: Belize condo resort, vacation in Belize, Ambergris Caye vacation. From our Sea Front Suites to our Pool View Villas, you are sure to find the perfect accommodations for your relaxing, romantic or family getaway to Belize. Enjoy spectacular beachfront views and amenities such as private verandas, air conditioning, beach loungers and more when you visit Sapphire Beach Resort. Our 1 bedroom/1-bathroom villas are set on the first and second floors of our seven Pool View buildings in a backdrop of exotic flora that surrounds the resort. All villas overlook two of our 3 pools as well as our very popular Tiki Bar. 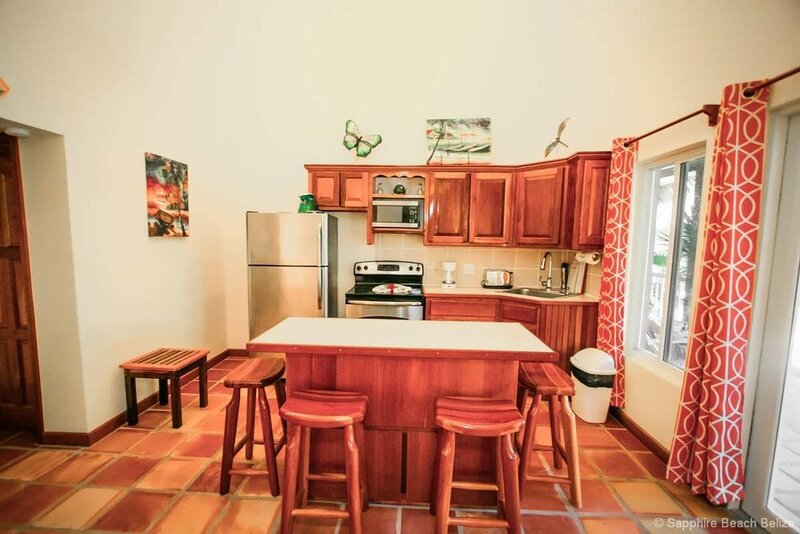 Each villa has a separate bedroom with a queen bed, private bathroom with shower only, a full kitchen with microwave, refrigerator, stove/oven, coffee maker, and toaster. These villas also feature a cozy balcony or porch to take in the tropical breezes every morning. Daily housekeeping is provided, electric safes are available to store your valuables and wireless Internet access is available onsite as well. Our large 1 bedroom/1 bath Garden View Villas are set on the ground floor of our Garden View Cabanas. All villas overlook the lush tropical flora and pool area located towards the front of the resort and even offer partial views of the Caribbean Sea from your private veranda. All villas have a large living room area with a large flat screen TV, a full kitchen with stove/oven, coffee maker, refrigerator and all necessary utensils. The bedroom features a queen-sized bed and its own en-suite bathroom. Additional in-room amenities include an electronic safe for your valuables, tableware, beach towels, and complimentary purified water. 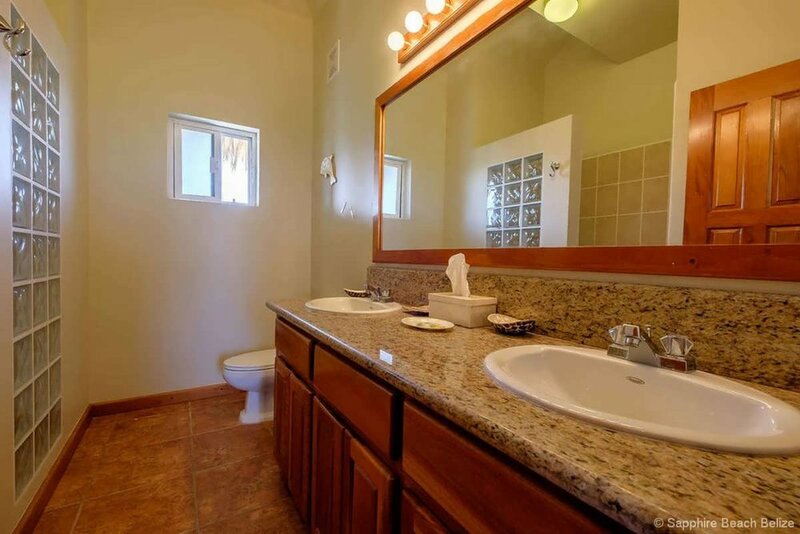 Daily housekeeping is provided and wireless Internet access is available onsite as well. Our popular Sea View Suites feature a 1 bedroom/1 bath layout.  All suites have a separate bedroom with queen bed, en-suite bathroom with shower only, full kitchen with a stove/oven, microwave, refrigerator, coffee maker, and toaster. The suites also feature a dining room with seating for four, living room and private patio complete with lounge chairs for you to sit, relax and enjoy the Caribbean Sun rising every morning. Each villa is air-conditioned and equipped with ceiling fans, and a larger flat screen TV. 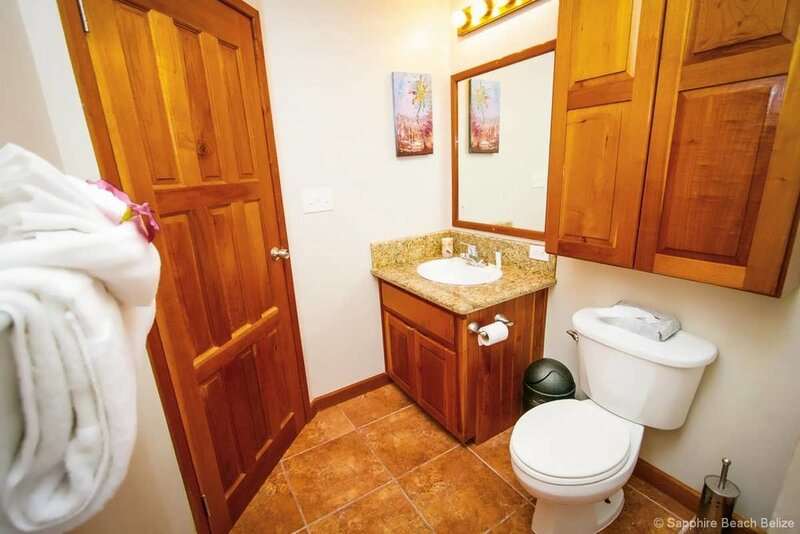 Daily housekeeping is provided, and wireless Internet access is available onsite. 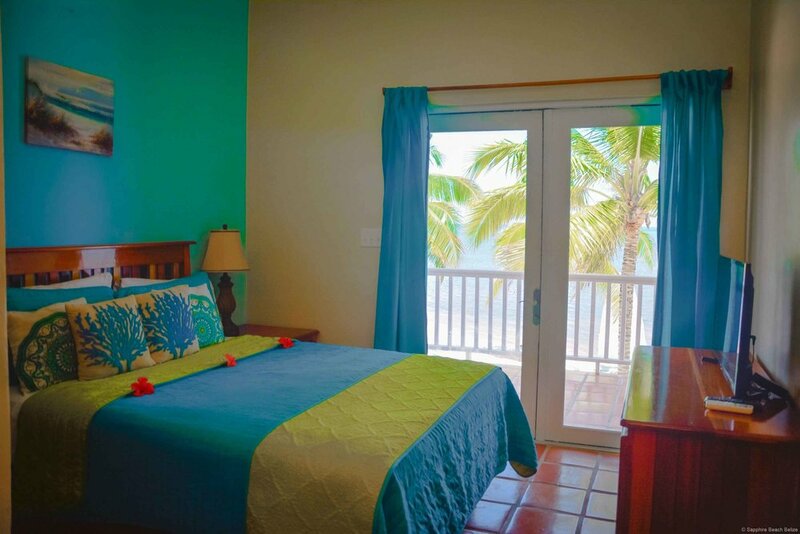 Located just steps from the beautiful beach and Caribbean Sea amidst swaying coconut palms, you will find our 2 bedroom/2 Bathroom Sea View Suites. 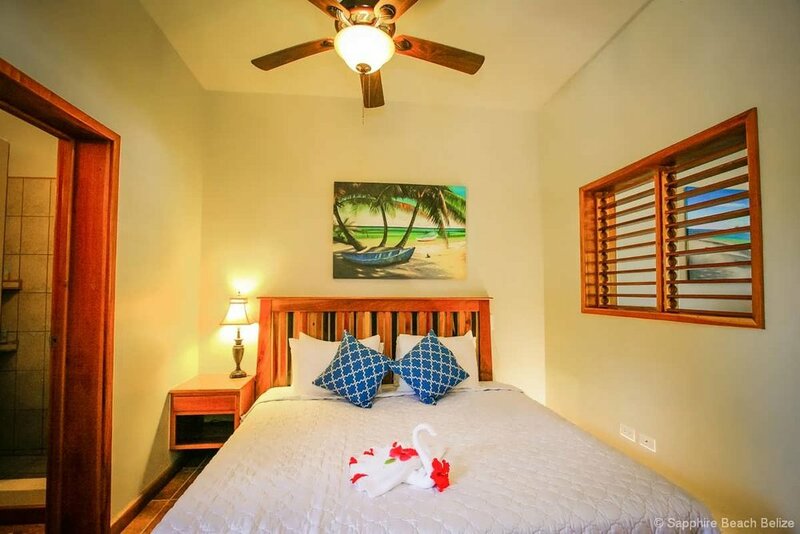 These gorgeous two bedroom/two bathroom Seaview suites at Sapphire Beach are equipped with queen sized beds and private bathrooms with hot/cold showers. Other features include a full kitchen and a dining area that can accommodate parties of six. The living room is fully-furnished and includes a large flat screen television. In addition, a full-size futon in the living room provides additional sleeping space. All of our luxury suites boast an outdoor covered veranda with a private seating area overlooking the resort’s tropical landscaping, the beach and beautiful Caribbean Sea. Additional in-room amenities include air conditioning, safe, hair dryer, and an iron and ironing board. Daily housekeeping is provided, and wireless Internet access is available onsite. The sea front suites at Sapphire Beach Resort are some of the most inexpensive sea front resort accommodations you’ll find on Ambergris Caye. You’ll be able to enjoy the cool Caribbean breeze in your living room and stepping down from your private balcony or patio directly unto our coconut palm-filled beach. All suites have a separate bedroom with a king bed, private bathroom with shower only, a full kitchen with refrigerator and stove/oven. Our Sea Front Suites also feature a dining room with seating for four, living room and private patio or balcony. Each villa has air conditioning and is equipped with ceiling fans. Daily housekeeping is provided offered and wireless Internet access is available onsite. These Two-bedroom sea front suites offer the best views of the Caribbean Sea. The suites are equipped with a king size bed in each bedroom and en-suite private bathrooms with hot/cold showers. Other features include a full kitchen and dining area that can accommodate parties of six. The living room is fully-furnished and includes a flat screen television. In addition, a full-size futon in the living room provides additional sleeping space. Each of our luxury suites boasts an outdoor balcony or patio with a private seating area overlooking the beautiful Caribbean Sea. 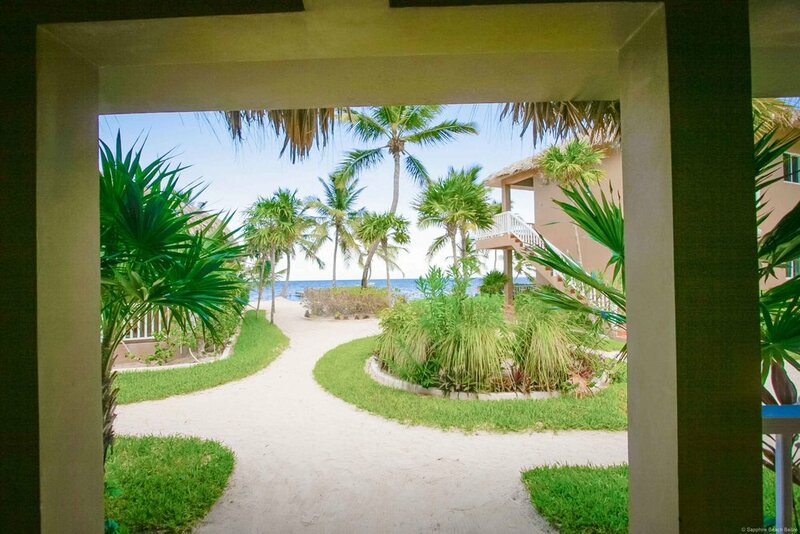 You are just steps from the shoreline and will enjoy cool sea breezes daily. You are just steps from the shoreline and will enjoy cool sea breezes daily. Additional in-room amenities include air conditioning, electric safe, hair dryer, and an iron and ironing board. Daily housekeeping is provided offered and wireless Internet access is available onsite. 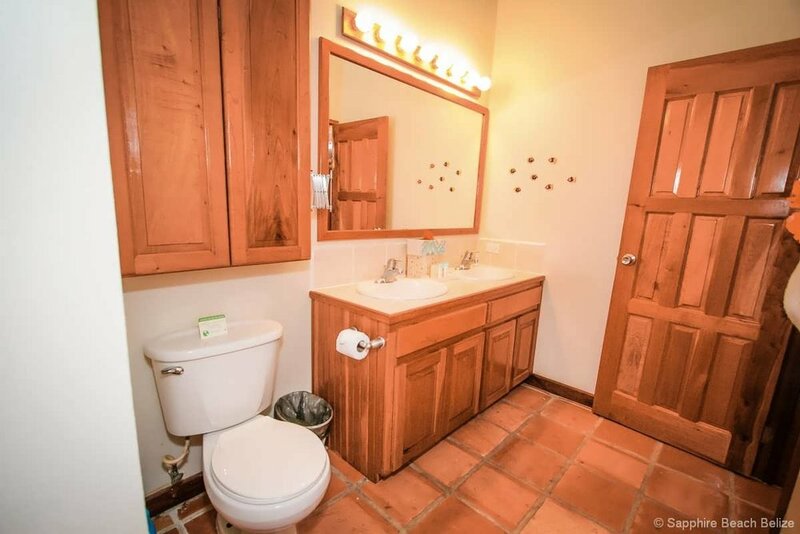 Providing the utmost in Belizean beach luxury, each room in our three bedroom penthouse suites offers a king size bed and private bathrooms with hot/cold showers. All penthouses feature a 2 level layout atop our Sea view buildings. The first level of the suites features the living & dining area, full kitchen, two bedrooms with a spectacular view of the beach & sea. 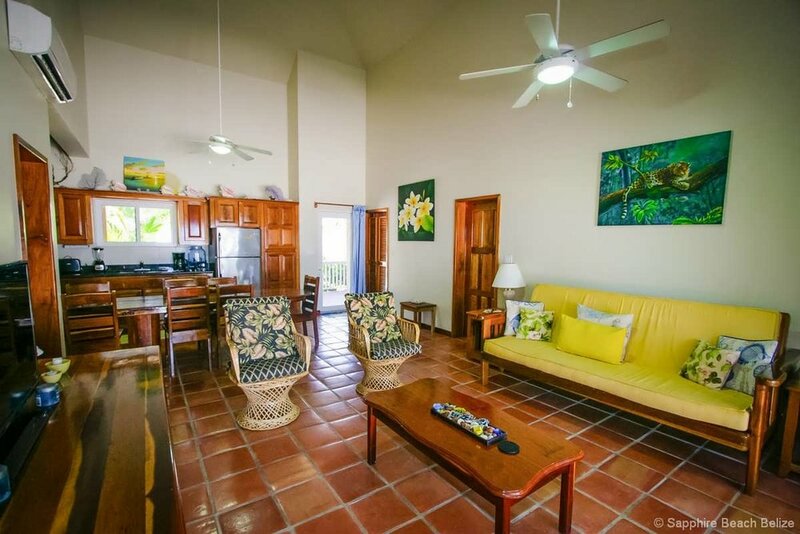 A twirling wooden stair leads to the second level where you will find the 3rd bedroom with magnificent views of the beach and vegetation around the resort and the most amazing panoramic view of the Belize Barrier Reef & the Caribbean Sea. You can enjoy a marvelous Sunrise right above the Caribbean Sea or a breathtaking sunset every day in this Penthouse suite. The fully-furnished living room includes flat screen television and a full size futon for additional sleeping space. Additional in-room amenities include air conditioning, safe, a hair dryer, and an iron and ironing board.